1. Read and Speak the entire English language by learning the Phonetic Code of just 1 word. Ae7o4nsz a22go9, a6 Co4szmi3c Ca1nno22n too16k ai6m a1nd ow5ne o4fv th+e22 lar11gje22st co4me22ts e2ver13 o4bszer13ved by8 star11 ga6zer13sz, wi3ll sla1m i3nto10 th+e22 pla1ne22t JU10PI3TER13 a1t 12 noo10n to22day6. The DD-Code more particularly formats the English language so 1 symbol represents only 1 sound, hence, identifying all sounds, of all letters of all words and visualisation of syllable formation of whole words by graphic differentiation of Vowel, Phonetic, Sound-Switch and Silent letter groups for deriving instant cognition of speech from the printed form. Below are the first 100 words learned by children at school. These words can take up to 3 years to learn by all children from prep-school to grade 2. Depending on time/ability, DD-Code can facilitate the learning of these words in 3 hours, 3 days or a week. Any young student using the DD-Code demonstration below can be at the top of the class in Reading even before going to school. Click on Group 1 Words then Click on the Plain Text Words to Hear them spoken. Next, click on DD-Code Button, and then the Letters to Read and Sound out each letter with your child. Make short Phrases / Sentences with these words in them for your child to Hear, then write these Phrases / Sentences in a scrapbook for ongoing Reading exercises. You can also click the Vowels and Consonants in the tables below to develop advanced Hearing, Speaking and Writing Ability. If you click the "Plain Text" button Top/Left of the page, it brings the page back to Plain Text, but you are still able to view the Phonetic Code of each word individually as you move the curser over each word. If you click the "P.A" button Top/Left of the page, the page is converted into the International Phonetic Alphabet which, which until now, large parts of the world use to pronounce the English language. 1. The Table below shows how the letter-A may have up to 10 different sounds: showing how just one letter can change sound from word to word many times within the language, making the language difficult for learners of English by inconsistency of the sound to letter code of English. 2. Conversely, the table below shows how just one vowel sound may have multiple English Vowel letter group representations: The table shows how the sound of “ee” may be represented by 12 different vowel letter groups, further confusing learners of English by the non-phonetic nature of the language. The DD-Code more particularly translates everyday printed text into an alpha-numero-graphic sound to letter format that forms a 100% reliable, speech to text phonetic code that is universal for instant decipherment of speech and reading from printed text. The DD-Code phonetic key is the binary code and absolute correlation that binds together the written and spoken forms of English and makes the English language 100% Phonetic for the first time in the 2,000-4,000-year-old history and evolution of the language. If you cannot read or speak French, play the video and see how to read and speak the entire language of French by knowing the Phonetic Code of just 1 word. Search the Internet using DD-Code Education Phonetic Text. Click DD-Code button when Site is up. If you click the "Plain Text" button Top/Left of the page, it brings the page back to Plain Text, but you are still able to view the Phonetic Code of each word individually as you move the cursor over each word. If you click the "I.P.A." button Top/Left of the page, the page is converted into the International Phonetic Alphabet which, which until now, large parts of the world use to pronounce the English language. In addition to preserving English and all languages of the world, one of the most important applications of DD-Code is facilitating the exponential use and spread of languages and has become the greatest single promoter of amity and friendship between countries ever known. Decipherment of The DD-Code and the 2000-year-old Phonetic Code of English education development is now a reality to eradicate of illiteracy throughout the world, entirely and genuinely for the first time in human history and puts mankind on its way to the stars earlier than time. 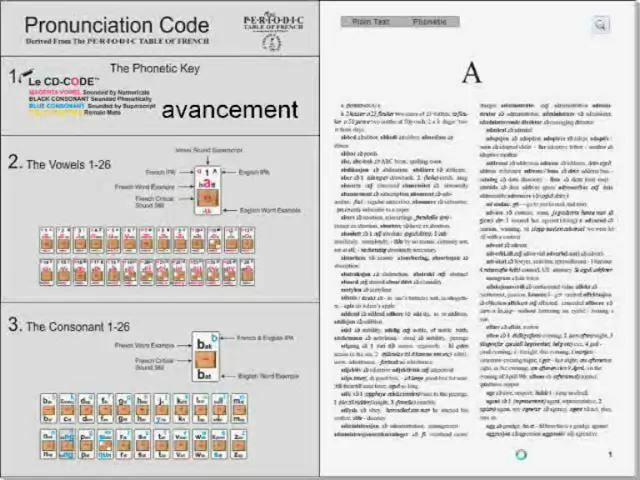 Derived from The P.E.R.I.O.D.I.C Table of English, application of DD-Code to the fields of education and communication breaks down international language barriers of all kinds by facilitating instant cognition for reading and speaking the language of English with virtually No requirement of memory to read and speak any and all English printed text. It is important to note that DD-Code is not limited to the language of English, and encompasses all languages initially including Mandarin, Japanese, Hindi, Arabic, Russian, Spanish, German, French and Italian and the differing Accents of these languages. Browse through our site and check out the line of DD-Code Education Programs. Purchase The DD-Code Main Literacy Education Program, from 3 years to adult: Click Here. Purchase Visual Primer, word phonetics on video, shown to babies and very young children 1 month to 3 years, for 1 minute a day: Click Here.